Elsewhere on this artbyisherwood website is the story of how the artist accidentally started a fire at his home in 1983. Hundreds of works of art were damaged and many totally destroyed. Two years after his death, the new owner of 151 Wigan Lane found paintings in the long grass at the end of Isherwood’s neglected garden. Last year, he sold some at Capes Dunn Auctioneers in Manchester. Now one of the paintings – National Gallery, London , bought by a collector has been fully restored by artist and art dealer Mike Dipple, who operates from Golden Days Garden Centre in Appley Bridge, Wigan. The unrestored painting is seen here, together with a photograph of Mike with the restored work. An amazing difference by anyone’s standards. 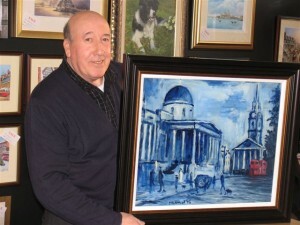 Mike told artbyisherwood how the painting was bought for just a handful of pounds. It was cockled, a piece missing from the right hand corner and burn marks were all too obvious. But Mike took on the restoration work – and it took several weeks in a heavy press to flatten the work of art. Then the missing slice had to be recreated. In all the work took 70 hours. Mike explained how the owner was thrilled that his painting had been “brought back to life.” Obviously a very close inspection reveals where the missing part has been reconstructed, but viewed from a normal distance, it is almost impossible to tell. 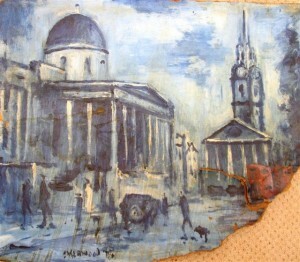 Molly Isherwood said that her brother-in-law would be delighted that one of his burned paintings had been so lovingly restored. It is estimated that the restored painting would bring a couple of thousand pounds in auction.